The Peacocks slipped to a late 3-2 defeat at the hands of Salisbury FC (29 Jan) which saw them end the match with 9 men at the final whistle. 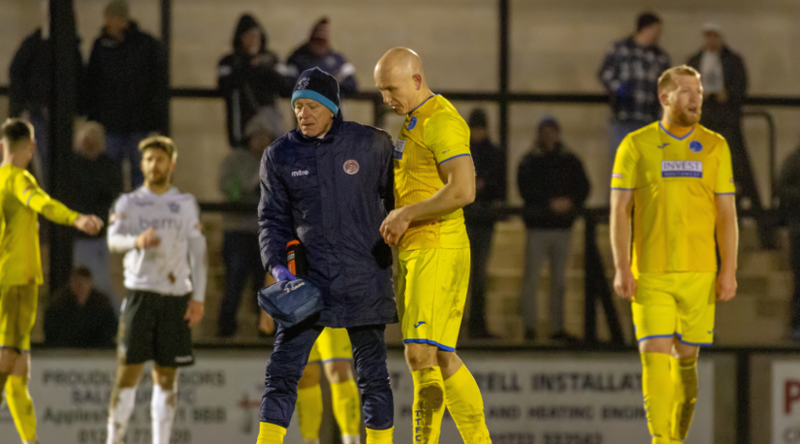 Town started the match full of energy which the hosts failed to cope with and it resulted in Shane White finding the back of the net to open the scoring on 11 minutes. A long hopeful ball upfield from the host’s defence found Hopper, who brought the ball down on his chest, turned and found the bottom corner perfectly to level the scores on the half hour mark. Neither side were able to add to the scoreline in the remaining 15 minutes and went in level at the break. Town restored their lead through a Ryan Brett free kick 7 minutes from the restart and were on the front foot until Ben Adelsbury received his marching orders on 60 minutes for a second bookable offence. Salisbury’s pressure paid off and with 15 minutes remaining drew level. Taunton had it all to do with 7 minutes left on the clock and found themselves 2 men down when Keith Emmerson was sent for an early shower following his second yellow card. It was backs against the wall for the visitors who where penned in their own half as the clock ticked down. The Peacocks looked to have held on for a point but the pressure ultimately took its toll as a low ball into the box found substitute Dan Fitchett to convert from close range, stealing all 3 points for the Whites 2 minutes into injury-time.